I fell in love with this salad when Weekly Bite was in it’s early blogging years. M was just a baby when I first posted this recipe and now she’s almost six-years-old. Salmon is still one of her favorite foods and both of my girls love this dish! My favorite kind of dish includes a starch, protein, and veggies in one, and this has it all. 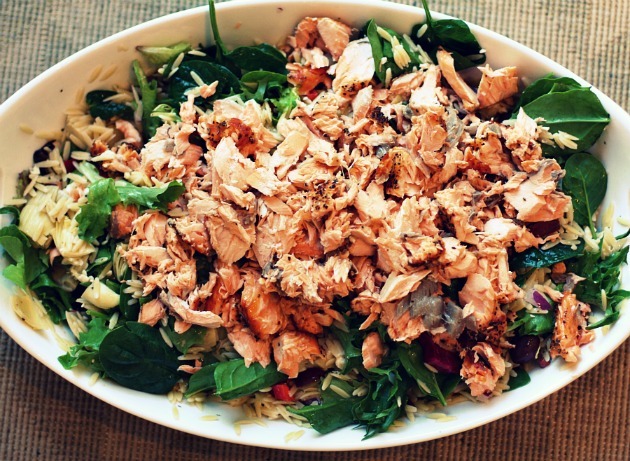 The combination of salmon and mixed greens is packed with nutrition. This meal is a great addition to your healthy lifestyle! I serve it with the leftover dressing on the side and sliced French Bread. Whisk all ingredients together and mix into salad just before serving. 1) Make recipe for Becky’s dressing, set aside. 3) Sprinkle salmon with salt, pepper, & oregano. Place under broiler for 10-15 minutes, or until center is cooked. 4) Cook pasta according to package directions. 5) Drain pasta and place in a deep casserole dish. Pour 1/4 cup of dressing over pasta and gently toss. 6) Once salmon is cooked, flake salmon using two forks. 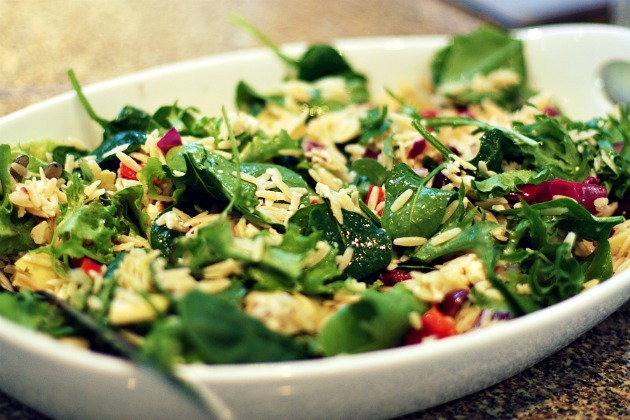 7) Too the orzo, add olives, red bell peppers, red onions, feta, artichoke hearts, & arugula. Use a forked spoon to gently combine all ingredients. Top with flaked salmon & serve with dressing on the side.